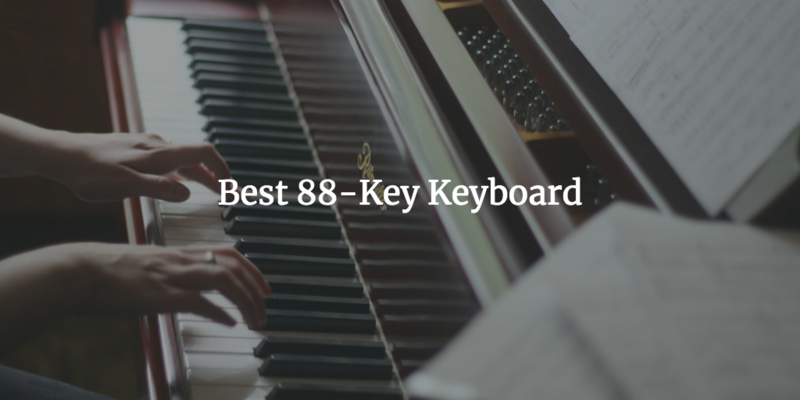 Are you in search of the best 88-key keyboard on the planet? Good thing you’re here then, because we have a vast selection of some of the best 88 key keyboards currently available. Even better, we’ll give you a detailed review of each one. 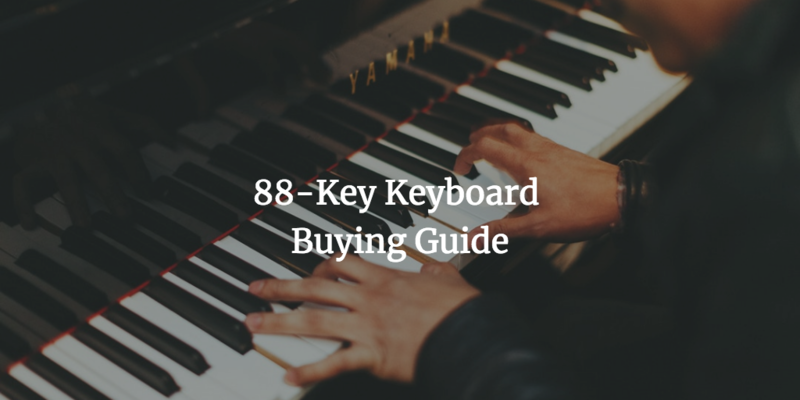 And to top that, we’ll throw in a comprehensive guide to what you need to know when buying an 88-key keyboard as well. 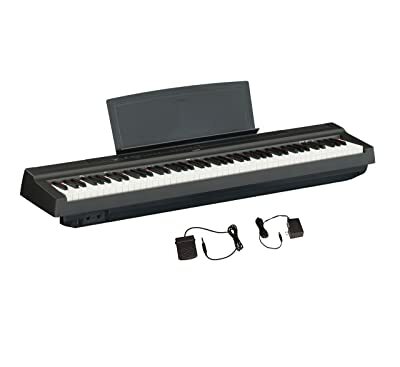 This beautiful keyboard is the big brother to the Yamaha DGX-650 – the Yamaha DGX-660. It’s absolutely gorgeous and its weighted keys are heavenly to play. Thanks to the hammer action incorporated in this keyboard, you’ll find that these keys give the right feel and response when played. If you want something that sounds very close to a traditional piano, then this definitely needs to be on your shortlist. The DGX-660 is also compatible with iOS devices which expands the piano experience and takes it to a whole new level. Aside from that, the keyboard also comes with a headphone jack and headphones too. Some people might have a problem with where it is placed because it’s round the back, though. And the speakers? They are lovely. Each of them engineered to deliver a pleasurable listening experience. The quality of sound from the speakers is really immersive. You’re not just hearing notes, you’re hearing music. There’s a microphone jack as well, to sing while you play. Of course! There’s also a foot pedal included, as well as a sheet holder and a bench. The foot pedal isn’t the best we’ve ever seen and slips every now and then. But, generally, it does a great job. If you want to get an upgrade, then get the 3-pedal version, but don’t forget to get a 2.0 USB cable as well. This isn’t a very portable keyboard. But then again, it is so well built and keyboards made with such build quality are hardly portable. 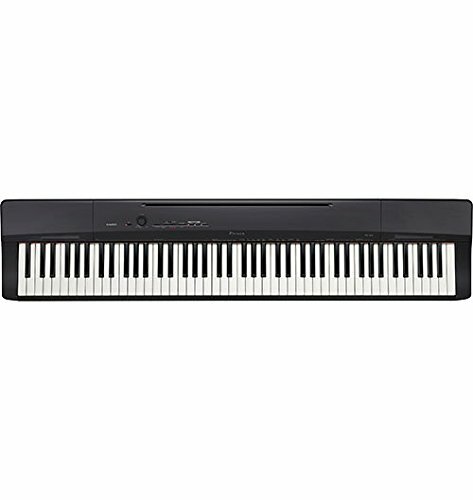 All in all, as is traditionaly the case with Yamaha, this is a wonderful keyboard and you can’t go wrong with it. Weighted keys with excellent hammer action. Headphone jack and mic jack. The P71 is obviously not on the same level as the DG-660, however, it is a great keyboard for the price. It comes with 88 weighted keys but does not have the hammer action of the DG-660. Although it doesn’t have the same feel as the DG-660, it still feels pretty good to the fingers. The keys are also pretty sensitive so you can hear your nuances. With very little effort, you are creating beautiful music and enjoying yourself while you’re doing it. It also has some serious volume, due to the high-quality speakers. It can go loud, if needed, even without connecting to a speaker. The pedal is great but you have to be a bit careful when using it. At first, it’s annoying but when you figure it out, it just seems quite funny. Okay, so you need to plug in your pedal before you power up your keyboard not after. If you do it the other way round, you’ll find that using your sustain pedal cuts the sound. Funny, isn’t it? But, in the correct order, as explained, it should do its job correctly. Also, this is a really sweet, compact keyboard. The DG-660 is practically immovable, but if you want a gig buddy, then you could try the P71. It’s very easy to move around and it doesn’t take up a lot of space either. It might not have all the bells and whistles of the DG-660, but for the price? This sure is a great keyboard. Portable with a small footprint. Pedal feels cheap, but at least it will make you laugh. So, we’ll start with the keys, which are really good. They are weighted and come with hammer action. You definitely can bank on the feel and sensitivity of the keys on this keyboard. They are very responsive and they give a feel that’s close to what you get on an authentic acoustic piano. Furthermore, there are loads of instruments and voices to help you customize your playing while creating the ultimate piano experience. We love the speakers on this keyboard as well. They are of high quality and it shows when playing. Of course, there’s a headphone jack as well. And when used, you can really immerse yourself in the music and play to your heart’s content. It’s quite an experience. The pedal is great but we wish it could stay put a little more. Pedals that move around, are a little bit of a pain to use and it would have been a real score for Kawai if they had made one that would stay put. Sadly, this keyboard does not come with a USB port but there’s a MIDI port. So you could go with that instead. The sound is great as well. We know it can’t possibly sound like an acoustic keyboard but hey, it does its best. Finally, this is a compact keyboard, so, portability isn’t a problem. For a keyboard that’s made to such a high quality, the fact that it moves around easily is very impressive. Authentic keyboard feel yet compact. Enough piano sounds as well as other instruments. Sensitive, weighted keys with fast response. The speakers sound a bit funny towards the lower end. Does not come with USB connectivity. Now, here’s one keyboard that makes music recording a lot more interesting and easier. This keyboard comes with a USB port to transfer audio files or MIDI. It also connects directly to your iOS device. This feature alone gives you so many options. For one, the sound library on this keyboard is pretty robust. But, when combined with the compatibility to your iOS device, it just goes to the next level. There’s no limit to the number of ways you can manipulate your music to create the unique and personal touch that you’re going for. The keys are weighted of course and feel very close to the real thing. And the sound is also quite beautiful, especially through the quality speakers. And, as usual, there is a headphone jack included for times when you want a quiet rehearsal. This keyboard comes with a CF sound engine. We don’t know if you’ve heard of the Yamaha CFIIIS Concert Grand Piano. Well, if you haven’t, don’t worry, because the CF sound engine reproduces that phenomenal sound on this keyboard. 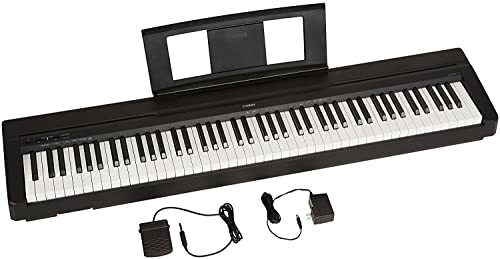 PS: This is another portable Yamaha keyboard. So, just in case you like the portability of the p71 but you want an upgrade, you could try this. CF sound engine reproduces Yamaha Concert Grand Piano sounds. 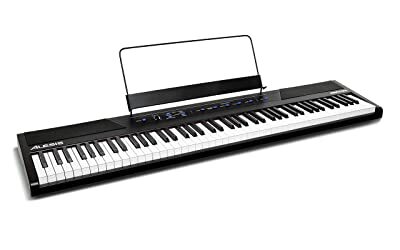 If you’re in the market for is a simple, down-to-earth keyboard without many bells and whistles, please allow us recommend this awesome Korg B1SP keyboard. It comes with 88 weighted keys that feel incredible to the touch. No plunky feel like a toy. They also produce a great sound too. Although one or two keys might tend to give a slightly off sound sometimes while playing, the sound is generally okay. Alright, let’s talk about the speakers. The speakers are very nice, the problem is, they aren’t very loud. If you can overlook that small issue, then you’ll love the B1SP. The included bench is quite solid which is a breath of fresh air. Most manufacturers don’t feel like we deserve a quality bench, so we have to commend those that do. Big ups to Korg for that one. Mind you, this keyboard only comes with one other output. It comes with its own speakers, yeah. But aside that, there’s only one other output for your headphones and that’s all. Excellent action on the keys. Some keys might sound a bit off. Before we begin to talk about its awesome ability to record music, let’s start off with the keys. We love the keys. First, they are weighted and come with a hammer action. So, for the price, you sure are getting something that’s over the top, in terms of the quality of its keys. And it’s not just the weight. They keys are also extremely sensitive. They respond to light touches super fast. It’s excellent if you love to play fast notes that require your fingers to fly swiftly over the keys. Okay, so next, let’s talk about the thing that we love the most about this keyboard. the fact that it’s a complete joy to record with. There is virtual software already uploaded on the keyboard – Ableton Live Lite 9. 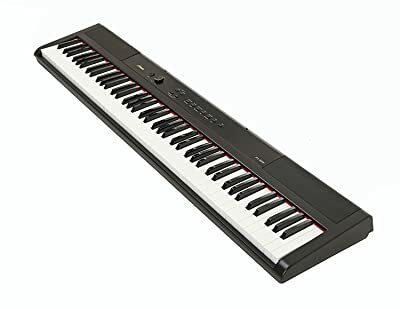 Plus, there’s also the USB-MIDI connection with which you can easily play virtual instruments and control your recording software. We told you it’s the ultimate experience. The MIDI controls of this keyboard are superb. You’ve got controls for modulation, pitch bend, volume, and octave too. Pianos hardly get more expressive than this. This is a really big keyboard so it will take up some space. Plus, it’s not exactly the keyboard you’d want to move around very often. Excellent keyboard choice for music recording. Weighted keys with hammer action. This is, perhaps, our most expressive keyboard on review today. Its MIDI controllers are fantastic. There are so many options and so many ways you can customize your music, to reflect the inner you seamlessly. And to ensure that it is truly seamless, the controls are kept within reach. So, your transpose buttons, the modulation wheels, and the pitch bend are close by. It makes playing intuitive and takes the hard work out of making music. Beyond that, this keyboard also supports almost all the popular DAWs. And there isn’t even a need to download a driver. It connects automatically. So, whatever DAWs you favor? From the Logic Pro X, to Cubase, to Reason, to Nuendo, to Garage Band and the rest. All of them are compatible with your keyboard instantly. The keys are okay. They are semi-weighted and come with medium tension. So, they won’t give you the ultimate almost-acoustic-keyboard feel like fully weighted keys with hammer action. However, Nektar has more than blown our minds with the DAW support stunt they pulled, so we are quite happy. Supports almost all popular DAWs. Superb MIDI controllers within reach. The feel of the keys could be a lot better. The Casio PX160 produces terrific sound and the new and improved speakers make everything even more interesting. You’ll love listening to yourself playing this keyboard, whether on the installed speakers, or with your headphones. There are some amazing voices included, that you’ll enjoy experimenting with. They give you the freedom to add your unique touch to your music and create the sound you love. Altogether, this keyboard does not sound cheap at all. It might not be an acoustic piano, but for something so affordable, this is a sweet deal. The action of the keys is great. But then we expect nothing less from a weighted hammer action keyboard from Casio. The resistance and the feel are pretty close to what you’d find on a traditional acoustic piano. This is a pretty straightforward keyboard as well – just plug n play. There aren’t too many functions or controls that could leave the user confused. So, yeah it is a great beginner keyboard. It’s also got a real nice size and weight to it, that makes it feel easy to move around. Simple, straightforward, and intuitive functions. Keys could feel better and be more velocity-sensitive. This keyboard is amazing and a great partner for you if you’re always on the go. The keyboard is designed with a slim build and semi-weighted keys. With these two features, the keyboard clocks in at just the right size and weight for portability. In fact, you can even adjust the sensitivity of the keys, if you prefer. So, if you are more comfortable with a harder touch or a lighter touch, the control lies in your hands. 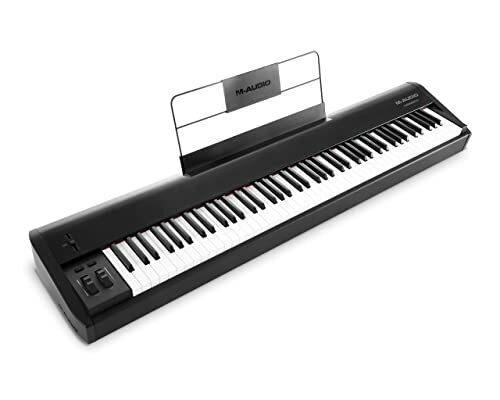 Also, on this keyboard, you’ll find 3D stereo instruments to create the ideal practice environment for the user. Apart from that, with its USB connectivity feature, you can easily connect to your learning software, DAW, or any music app. Plus, it comes with an output for headphones, amplifier, with a jack for the pedal. USB connectivity for connecting with learning software, DAW, and music apps. Keys feel cheap and plastic. This is an excellent keyboard for the beginner. The keys are semi-weighted, however, they do not feel cheap by any means. Furthermore, this keyboard is really portable. So, moving it around isn’t a problem. It also comes with two power sources. You can plug into the mains or you can operate it on batteries, which are not included. The speakers are really good too. At this price? Hmmm… thumbs up to Alesis. The keys are not so sensitive even though the response is adjustable. Sometimes you might need to plunk down a little hard for the keys to play. But then again, this is a really affordable keyboard, so we will let that slide. In addition to all these features, you’ll find an output for headphones and external speakers as well as a sustain pedal. It also features USB connectivity. So, you can easily upload your MIDI. You can also use this keyboard with any virtual instrument as well. Comes with the option for batteries. Keys could be more sensitive. We know you’re looking for an 88-key keyboard but what kind of keyboard are you looking for exactly? You see, the truth is that every standard keyboard has 88 keys – 52 white, and 36 black. But there are different types of keyboards. And each type varies a lot, from price, to sound, to playability. Well, if you don’t know what keyboard you’re looking for, relax. We are going to explain it all to you. An acoustic piano is the largest of all the piano types. It is also the most expensive, naturally. If you want to develop piano skills that rival those of Ray Charles, then you want to get an acoustic piano. The sound from the acoustic piano is ethereal and you can always hear the clear difference the moment it is played. The range of dynamics, responsiveness and tonal quality of an acoustic piano is unmatched across all the types of keyboards. If you’re just learning to play the keyboard, it will do you a world of good to get an acoustic piano as soon as possible. It will help you to fine tune your skills early. However, as we said, acoustic pianos cost more than a pretty penny. Most cost close to ten thousand dollars! And those are the everyday ones. For a baby grand or a grand, then you should be ready to pay much, much, more than ten thousand dollars. If acoustic pianos are the best thing since sliced bread, then digital pianos are the next best thing. Not everyone can afford an upright, a grand or a baby grand but if you can get a digital piano, then that’s fine too. Manufacturers usually craft digital pianos to sound like the acoustic piano. Plus, they also try to make the keys weighted so they give the same feel as an acoustic piano. Also, the keys of a digital piano are usually quite resistant to touch, sensitive to pressure and speed. And they do give a good range of dynamics. Of course, it won’t exactly give you the same experience as an acoustic piano but it’s a good start. Plus, it’s not as expensive. Okay, this is the most affordable of the bunch. 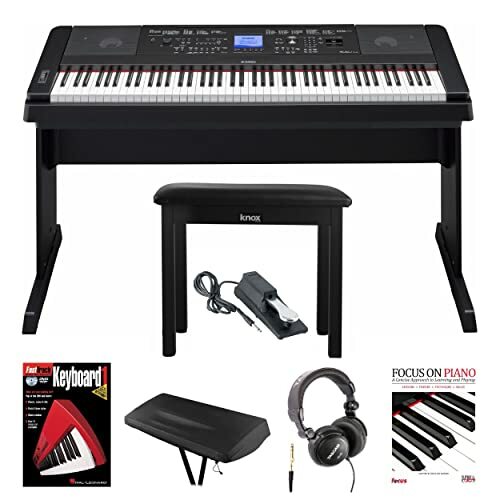 Electronic keyboards are very varied in their price range and features. Truth be told, it’s really hard to call these things a keyboard. They are actually mini synthesizers at best. If you’re going for this type, then your most important considerations should include, whether or not the keyboard comes with weighted keys. You also want something that comes with 88 keys because there are some that come with less. Although the acoustic piano seems like the crème of the crop (which it is, by the way), it does have a few drawbacks. Aside from that, you can connect most digital pianos and electronic keyboards to a computer. You can’t do that with an acoustic piano. That means that the only type of keyboard you can use with a music production software is a digital piano or electronic keyboard. Digital pianos and electronic keyboards are portable, acoustic pianos are not. If you’re going to get an acoustic piano, then you must have a reasonable amount of space to put it in and leave it there. 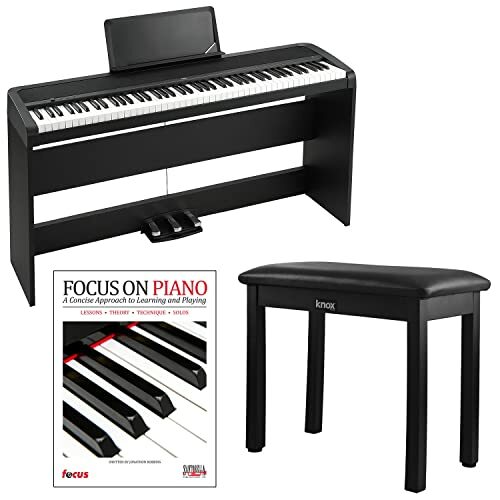 Digital pianos and electronic keyboards can easily be played on a table and then be removed afterwards. Still, nothing beats the acoustic piano in terms of musical quality. If you can afford to spare the cash and have the room to keep one, then we would say, go for it! The action refers to how the keys respond. There’s the weighted, the semi-weighted, the synth, and the hammer. The weighted and the semi-weighted are the closest you can get to a traditional acoustic piano. Hammer action uses actual hammers (mechanical ones, mind you) to make the response from weighted keys even more enhanced. Synth offers the least resistance, so one can often glide pretty quickly through keys while playing. All that said; your style of play should determine the kind of action you go for. This refers to how fast the keys can sense when they are pressed and how quickly they can send the corresponding MIDI message. As the name probably suggests, it’s the number of sounds a keyboard can play at one time. Some keyboards come with such impressive polyphonic capacities that they can mimic a complete orchestra. This is similar to polyphony. It’s the ability of a keyboard to play different sounds at a time. Polyphony, number. Multitimbrality, ability. MIDI, in full, is Musical Instrument Digital Interface. They are like musical messages transmitted between computers and electronic instruments. They do not contain sounds, but they are more like a blueprint for instruments to play notes from. So, from the MIDI, an electronic instrument, whether virtual or real can play a piece of music with the notes and velocity the MIDI message indicates. If a keyboard is MIDI compatible, it means that it can send and receive such messages. There are all kinds of keyboards these days with diverse kinds of interfaces for connecting with a computer. You should also look out for audio ins and outs. Ports with which you can connect to mixers, speakers, or external amplifiers. This becomes especially important if you intend to play live with your keyboard. If you like messing with sound and cooking things up, look for something that allows you to record your samples. After recording your sample, you can alter it and play it back in many different ways. Weighted keys with hammer action and a fantastic authentic feel? Check. Amazing sound? Double check. Quality Speakers? Check. Our choice? Definitely the Yamaha DGX-660 88 Weighted Keys Digital Piano Bundle. It’s our winning keyboard of the lot!